One of the major attributes we had factored in to our Sock-Off 2011 testing is Durability. I think all of us (me, Adam and Bill) pointed out in our reviews that we had a limited amount of time testing these Merino wool socks before writing and so the durability of the product was not really put to the test. In my review of the Point6 Hiking Tech Merino wool socks I was impressed that the socks looked completely unaffected by a 9-mile hike through rugged desert terrain. Now, these socks have been through another 60 to 80 miles of hiking, logged a little over 90-miles worth of running, about 60-miles biking and have simply been on my feet more than most other socks I own since my initial review. I am happy to report that they STILL look as good as they did the day they arrived in the mail. They have not faded, worn or lost their shape in any way. They show, literally, NO signs of wear at all. These tanks can take anything you throw at them. I am very impressed. 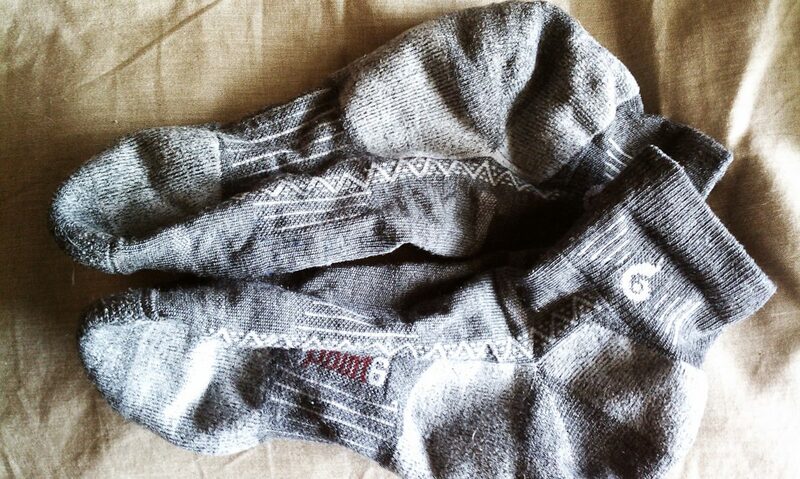 I originally got these socks from Point 6 in 2011. This update is mid-2015 and I am still wearing these same socks regularly, they still look JUST LIKE THIS and have shown absolutely no signs of wear. I have been remarkably impressed with Point 6 quality and have become a huge supporter of their product. I have met a few (very few) people who are not fans but mostly is has to do with personal fit. I don’t know anyone who has had complaints about durability or quality. Injinji synthetic toesocks pricing ranges depending on the style you choose. They range from very light no-show running socks to the heavier, crew-socks to full calf compression socks. The pricing of the socks mentioned in this review range from $10 to $16 which is very competitive for a specialty sock. This review centers around the Performance Series Lightweight Ultra-Thin Mini-Crew and the Original Weight Moderate Mini-Crew. Injinji has also come out with an Outdoor Series Original Weight Mini-Crew which I look forward to trying out. Injinji socks are available almost anywhere. Unfortunately, their full line is usually not in stores. I have found that even though I can buy these socks at almost any apparel store, they typically only carry one or two styles and only one or two colors. For the full spectrum of what Injinji offers, you really need to hit up their website. So, it took me a while to try these on. I have to admit, they sat for a while as I pondered the strange idea of a sock that wrapped around my toes. Once I began my recovery I found myself excited to get outside AND excited to test out these socks. So I took them with me over my Thanksgiving trip and tried them out on some basic, flat running trails. Initially putting them on is awkward. That first time slipping them on and trying to get your toes in each little pocket is taxing, but once they are on (properly!) the fit is pretty pleasant. I actually wore them around the house for a while before taking them out for a spin and I found them so comfortable I almost forgot they were on. This was not the case with the original-weight socks, you always feel those. But with the ultra-thin socks, it’s like not wearing socks at all. The synthetic material does have a lot of stretch to it, so the fit is very nice. They cling to your feet and conform to the shape of your foot instead of the other way around. I give them full marks for comfort and fit. Here’s where Injinji is weakest in my opinion. The socks are uniform in padding so they’re either thin all over, or thicker all over and don’t offer any technical support for specific parts of the foot. It’s a very minimalist concept for a sock. The ultra-thin would make a great running sock, in the right shoe and with on a paved route. 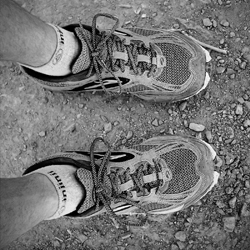 For me, my trail runners are a little big to allow for padded socks when I hike, so there was a lot of extra room in the shoe with the ultra-lights on. They seem to fit much better in my road-runners which are a half-size smaller. They offer nothing for padding making them a very poor trail sock. The Original Weight socks are much more appropriate for the trail, but still lack the padding and support I like to have on rugged trails. These socks were put through the paces much more than the Point6 socks I reviewed before. I took them out for two 6-mile runs and a 6.5-mile hike. One of the runs was in a rain storm, so I got to see how they handle being wet. The Light-Weight Ultra Thin’s were already showing signs of wear after the two runs. They seem to be wearing at the heel and at the top of the toes. I imagine the Original Weight socks will not wear out as fast, but the thinner socks don’t really seem to be holding up. They became saturated in the rain very quickly I did notice a little slipping on the foot when they were wet which worried me a little. When the run complete, I did not have any blisters or hot spots on my feet so I guess they did their job. Overall impressions are mixed. On the one hand, these are very comfortable socks to have on. The material between the toes is not as invasive or bothersome as I expected it to be. In fact, if anything, this is what makes the socks comfortable in the first place. The material is a mix of synthetics (70% CoolMax 25% Nylon 5% Lycra) that makes for a very comfortable sock against the skin. They are soft, pliable and breathable. However, they just don’t offer the padding or support that is ultimately desirable in an outdoor trail sock. This is why I am excited to try their Outdoor Series. If they can offer the kind of padding needed, these could be a great trail sock. I don’t even mind the fact that they are 100% synthetic because they do feel nice. I just don’t expect them to have the lifespan of a well-made 100% wool sock. I had an extra pair of the lightweight socks when I did the hike so I offered them to my buddy who did the trail with me. I wanted to see if he would have a different perspective on the socks. He communicated a lot of the same things I mentioned above: shoe felt looser due to thin sock material, padding was not sufficient for rugged trail hiking, comfort and fit was very nice and the sensation of the sock around each toe was very comfortable once you got used to it. He speculated as well, that the socks would probably perform much better on pavement in a tighter shoe. Don’t forget to visit Hiking the Trail and Diary of a Day hiker for their own comprehensive reviews of the Injinji hiking socks for SockOff2011! 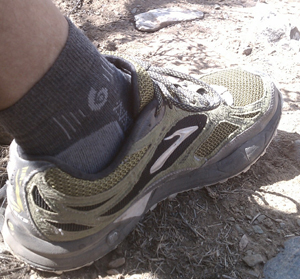 Stay tuned for my next SockOff2011 review featuring the Thorlo-CoolMax Synthetic trail running sock. The entire line of Point6 socks have a very competitive price point compared to the rest of the market. The hiking tech medium mini crew is priced at $17.95 which is right in the middle of the $16-$20 range for most wool/wool-blend hiking socks. Point6 socks are not widely available as of yet (though they seem to be expanding their market). I was not able to find any retail locations in the Phoenix area and only two or three locations in the Houston area that carried the product. 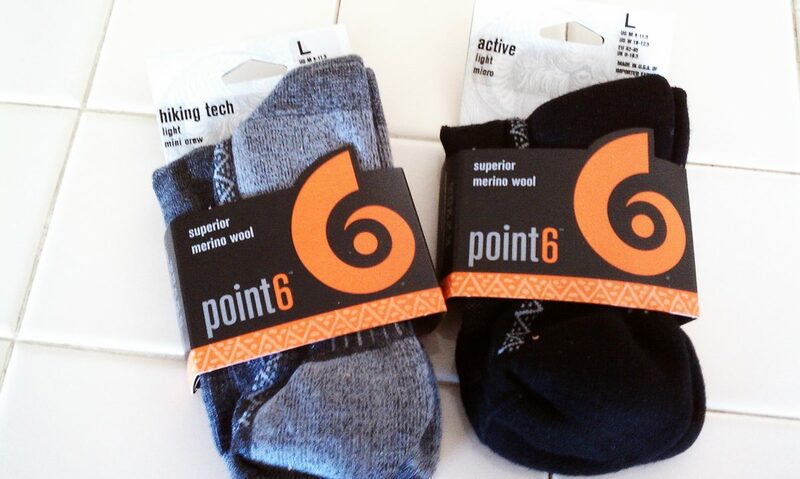 Even the places in Houston I found that carried Point6 socks, only had two or three options in the store. However, Point6 has a fantastic website and makes shopping for the right sock and ordering the sock extremely easy. Order processing and shipping is very fast. As soon as my Point6 socks showed up in the mail, I put them on. The fit is amazing and they are extremely comfortable to wear. The toe doesn’t twist or bunch, the heal drops right in place and the top fits snug and secure. I have tried a lot of different socks and the wool socks are not as soft, typically, as the wool-blends but these wool socks were not rough or abrasive (as most people expect from 100% wool products). 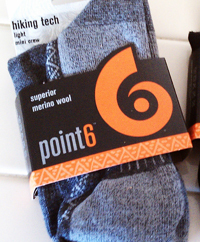 Point6 has a very comprehensive padding and support system designed into their socks. From the ultra-smooth toe seem to the arch support to the ankle bracing, these socks fit the bill for versatile, supportive sock structure. I have very high arches and some chronic ankle problems so finding a sock that can support my foot usually means looking for a very technically designed sock. My new Point6’s seemed to provide support in all the right places and padding where I needed it. I don’t look for a ton of padding from my socks (I expect my insoles to do their work). The “sport-specific” cushioning in these socks did it’s job. We really didn’t test these socks long enough to judge durability properly, I will say this though: After one 9 mile hike in the dusty, rocky desert terrain I was in these socks looked exactly the same as they did when they arrived in the mail. Amazingly, I was sweaty, dusty, dirty, scraped and sunburned and the socks were dry, clean and unaffected. See durability follow up here. My overall impression of the 100% Merino Wool Point6 Hiking Tech socks is that they are great outdoor socks. They provided me with everything I look for in a hard-use outdoor sock. They are relatively lightweight, they seem (time will tell) very durable, the fit and function is flawless. I would highly recommend these socks to anyone who is hard on their outdoor gear. Don’t forget to visit Hiking the Trail and Diary of a Day hiker for their own comprehensive reviews of the Point6 hiking socks for SockOff2011!